Individuals respond differently based on their own unique physiology. As such, efforts are made to tailor treatments suited to your needs, belief systems, lifestyle, and any coexistent conditions and/or medications. Heart failure is a very common condition. About 5.8 million people in the United States have heart failure. Both children and adults can have the condition, although the symptoms and treatments differ. This article focuses on heart failure in adults. Doctors also can use ultrasound during cardiac catheterization to see blockages in the coronary arteries. Ultrasound uses sound waves to create detailed pictures of the heart's blood vessels. Coronary angioplasty (AN-jee-oh-plas-tee) is a procedure used to open narrow or blocked coronary (heart) arteries. The procedure restores blood flow to the heart muscle. Angioplasty can restore blood flow to the heart. During the procedure, a thin, flexible catheter (tube) with a balloon at its tip is threaded through a blood vessel to the affected artery. 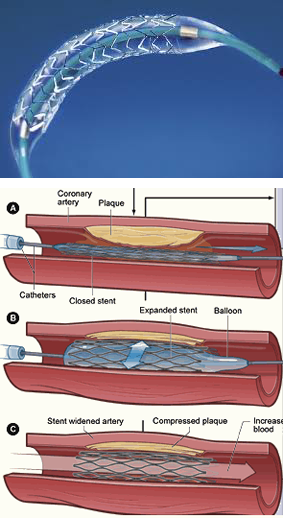 Once in place, the balloon is inflated to compress the plaque against the artery wall. This restores blood flow through the artery. 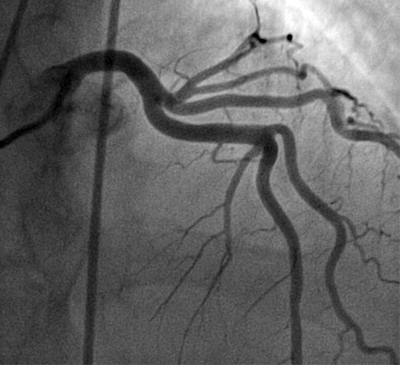 Serious complications from angioplasty don't occur often. However, they can happen no matter how careful your doctor is or how well he or she does the procedure. The most common complications are discomfort and bleeding at the catheter insertion site. Research on angioplasty is ongoing to make it safer and more effective and to prevent treated arteries from narrowing again. You might have arthritis or another medical problem that prevents you from exercising during a stress test. If so, your doctor may give you medicine to make your heart work hard, as it would during exercise. This is called a pharmacological (FAR-ma-ko-LOJ-ih-kal) stress test. Doctors usually use stress testing to help diagnose coronary heart disease (CHD). They also use stress testing to find out the severity of CHD. Plaque narrows the arteries and reduces blood flow to your heart muscle. The buildup of plaque also makes it more likely that blood clots will form in your arteries. Blood clots can mostly or completely block blood flow through an artery. This can lead to chest pain called angina (an-JI-nuh or AN-juh-nuh) or a heart attack. During a stress test, if you can't exercise for as long as what is considered normal for someone your age, it may be a sign that not enough blood is flowing to your heart. However, other factors besides CHD can prevent you from exercising long enough (for example, lung disease, anemia, or poor general fitness). Doctors also may use stress testing to assess other problems, such as heart valve disease or heart failure.